The Edge attended a Jeff Koons-curated show last night at the New Museum, as part of Armory Arts Week in New York. Of the dozens of art world events happening as part of Armory Arts Week in New York right now, one of the most buzzed about was last night’s New Museum’s opening of a controversial show that features highlights from the personal collection of Greek billionaire Dakis Joannou, curated by artist Jeff Koons. At last night’s opening party Koons, wearing a crisp black suit, wandered the galleries with his daughter. Speakeasy caught up with him on the fourth floor of the museum, which featured an eclectic mix of works including brown gouache paintings by Kara Walker and a sparkling sculpture called “Super Sister” by Liza Lou of an oversized bejeweled woman with an afro wearing short-shorts, platform red heels. “Skin Fruit: Selections from the Dakis Joannou Collection” marks the first time Koons has taken on the role of curator. Koons and Joannou have been friends since 1985, according to the artist, and Athens-based Joannou has been one of the earliest and most prolific collectors of his work. The exhibition is the first in a series called “the Imaginary Museum,” that will present significant private collections as exhibitions in New Museum. That didn’t stop crowds from turning up for last night’s opening party. The elevators were so packed for much of the evening that many guests decided to walk between the four floors through a narrow stairwell. Downtown hipsters, artists and a random smattering of celebrities, including Cyndi Lauper, Pierce Brosnan and fashion photographer David LaChapelle, wandered the galleries. 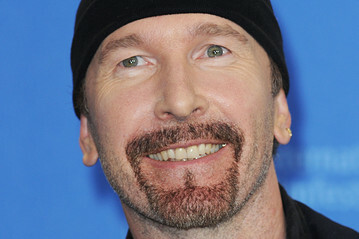 U2’s the Edge, in his telltale black beanie and a plaid shirt, seemed to offer the most distraction from the artwork for star-struck onlookers. “He’s still so cute after all these years!” said one young female gallery wanderer, within earshot of the musician. Standing near a tall rock-like sculpture by artist Dan Colen, decorated with graffiti-style writing and wads of chewed gum, the Edge, who’s real name is David Evans, told us that he was impressed by the size of Jaonnou’s collection. “It’s incredible to see it all in one exhibition,” he said. Though he wouldn’t call himself a major collector of art, Evans told us he does own works by Jean Michel Basquiat and Damien Hirst, whom he calls a friend. On the second floor, a woman wearing all black and a museum-credential badge and facing a wall, broke out into song every few minutes near a white Carrara marble sculpture of several people lying on the ground in body bags, a piece by Maurizio Cattelan. “Thiiis is propagaaaaaanda,” the woman sang melodically before matter-of-factly announcing, in a speaking voice, “This is Propaganda, 2002, by Tino Sehgal,” referring to the title and author of the performance art piece she was putting on. (Sehgal currently has a retrospective at the Guggenheim Museum uptown.) “Yes! I’m a piece!” she answered a few confused onlookers who needed clarification.